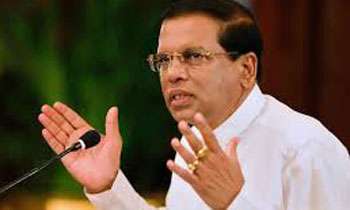 With reference to recent local and international media reports that President Maithripala Sirisena was reported to have mentioned at the Cabinet meeting held on Tuesday (16), about an alleged plot to assassinate him by the Indian Intelligence agency Research and Analysis Wing (RAW), the President Media Division (PMD) today clarified that the President had not mentioned any involvement of an Indian intelligence service. Issuing a media release, it said in the Cabinet Meeting on Tuesday, the discussions had taken place on the alleged plot to assassinate the President. “In the meeting, the President emphasized the need to conduct a comprehensive investigation into the alleged assassination plot. Among other topics discussed at various times during the said Cabinet meeting, was the development of the Eastern terminal of the Colombo Port. The President high lighted the importance of Sri Lanka has a deep-sea port terminal in the interest of the national economy. 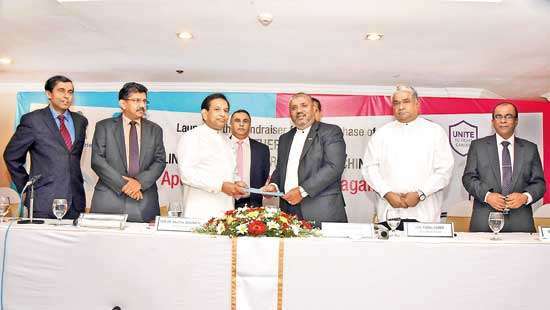 “India and Sri Lanka have maintained cordial relations and cooperation since the inception of this Government. Several high-level visits have taken place between the two nations that have resulted in strengthening cooperation in many fields. 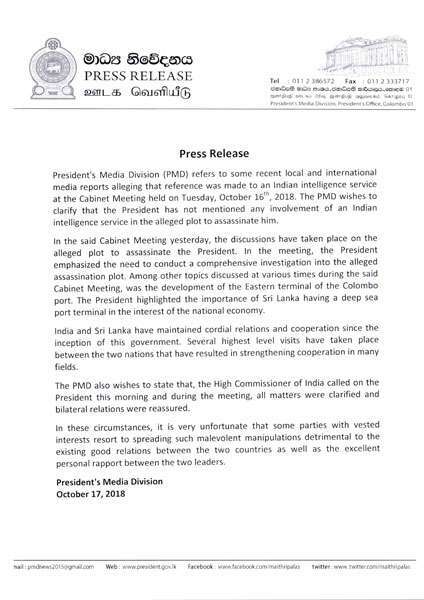 “The PMD also wishes to state that, the High Commissioner of India called on the President this morning and during the meeting, all matters were clarified and bilateral relations were reassured. “In these circumstances, it is very unfortunate that some parties with vested interests resort to spreading such malevolent manipulations detrimental to the existing good relations between the two countries as well as the excellent personal rapport between the two leaders,” the statement said. That means nowadays the Media can write anything they want? Being the Prez, why can't he sue them. Making lame excuses, but the damage is done.Must always think before you talk loosely. Why don't u return the free ambulance service provided by India, if you guys have the balls to do it. You mean to use a "Toothless Comb" ? Buffalo,I am 100% certain that you are a dirty RAW operative living in and out of Sri Lanka. He admits that the President has stated that an Indian Intelligence Service is trying to assassinate him. That is the core issue. Whether it is RAW or any other, is immaterial as all the Indian Intelligence Services fall under purview of Government of India. now drinking party is over. This damage control statement would not control the damage already done as the accusation remains the same. Still it is an Indian Intelligence Service. 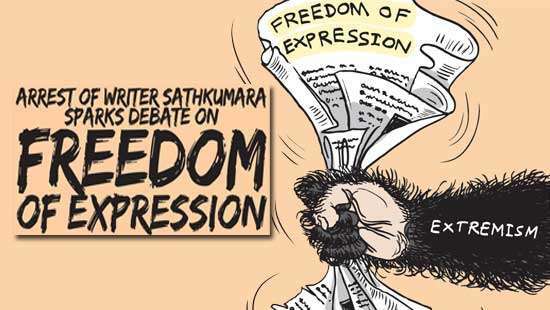 India is a dangerous country that never been supportive to SL. One should not forget the fact that they trained LTTE terrorists and given them ammunition in late 70s. India act like the boss to the smaller countries in the region. In fact, they influenced the regime change in 2015 for which a praised had been earned from none other than US president. 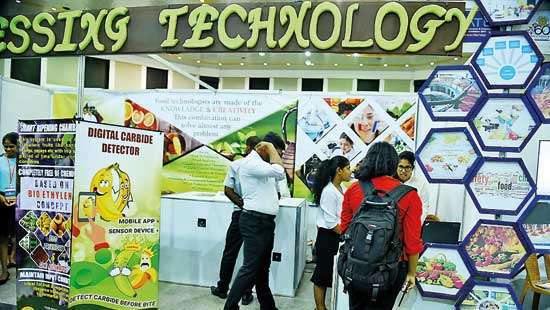 And now again, India seems to be backing Mahinda and wants to throw out MS-RW duo. No need of this drama and why should RAW waste a bullet on this President people will do the needful through ballot by end of his term !!! Its hilarious what this man is saying. Indian intelligence is non other than RAW. Now damage control, but with this statement, this fellow also joins the fools society like his Master he is trying to protect. Just going by utterances of late by the President, one cannot but get the feeling that either paranoia is getting the better of him or that he is trying to get the sympathy of those disappointed voters, who elected him to office with high expectations, in order to run again in 2020. It is a shame,you being a Tamil and don’t want to admit bad about Indians. Do you know how many Tamil girls were gang raped by the Indian Army ? How can the Prez come to a conclusion that an Indian intelligence or RAW is planning to assassinate him? This is ridiculous. If this is True... then it should be the belief RAW are under some influence of US or RUS to make SL unstable so that IND can benefit a better arms deals from either of these countries. IND are yet to challenge CHN on the high seas. The Advisor states that the President never mentioned RAW but said "an Indian Intelligence Service". An Intelligence Service of India means it is an Arm of the Government of India, which means the Prez accused India for the plot to assassinate him! It looks, if the Prez slipped the tongue the Advisor is rubbing the mouth!!! It's too late to hide the truth, better to be keep quiet.